[T]his book is intriguing whether you're a serious unicyclist or simply want a fun diversion alongside your major sport. Kris' book inspires me to get out and ride! By subscribing you will receive periodic e-mails from Kris Holm Unicycles with riding tips, unicycle news, stories and the occasional product announcement. You can unsubscribe at any time. Mountain unicycling ("muni") involves riding over any kind of rough terrain, from easy gravel paths and dirt roads to technical climbs and steep descents. Although at first intimidating, it is surprisingly easy to get started. In fact, if you can ride down the street, you already have the skills to start mountain unicycling. 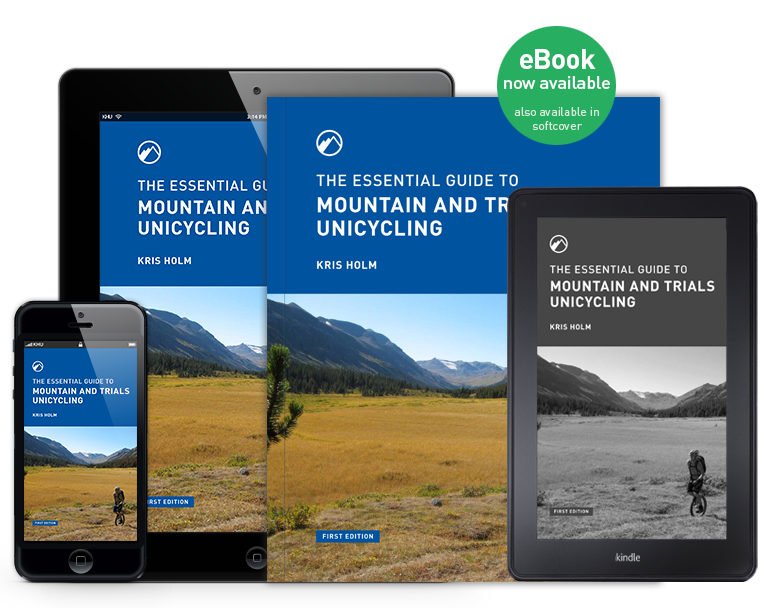 As you read through the Mountain Unicycling chapter you will find basic techniques for riding off-road as well as more advanced skills for climbing and descending rough, slippery, and steep terrain. You will also learn ways to adapt these skills to your personal goals, whether these include riding the most difficult terrain you can find, traveling fast and efficiently over longer distances, or going for a casual spin on local trails. The object of unicycle trials is to ride over obstacles. From urban features to rocks and logs, unicycle trials can be done almost anywhere. The challenge is technical — you’re trying to get from the start to the finish of a section or sequence of obstacles without falling off. Within the Trials chapter you will find techniques for hopping, gapping, dropping, pedal grabs, still stands, and riding balance lines. For riders who are not trials specialists, you will find ways to adapt these techniques to improve your technical mountain unicycling skills. Kris Holm is one of the early mountain and trials unicycling pioneers and is the founder of competitive unicycle trials. He was one of the first riders to bring mountain unicycling to a mainstream audience through film, television, and magazine features, and plays a key role in the innovation of modern unicycling equipment through his brand, Kris Holm Unicycles. Kris’ main interest is independent, exploratory riding, which has taken him down mountains in North and South America, across remote regions in Bhutan and Mongolia, and through the beautiful trails closer to his home in Vancouver, British Columbia. 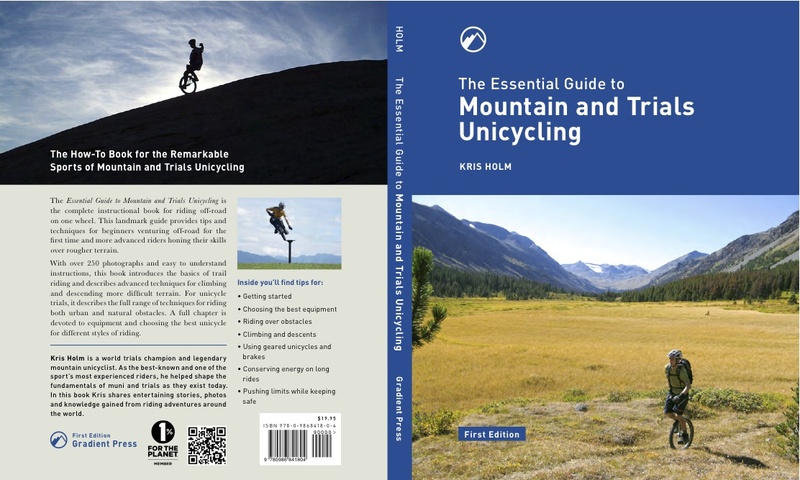 The First Edition of the Essential Guide to Mountain and Trails Unicycling features a full colour layout finished in perfect bound softcover. 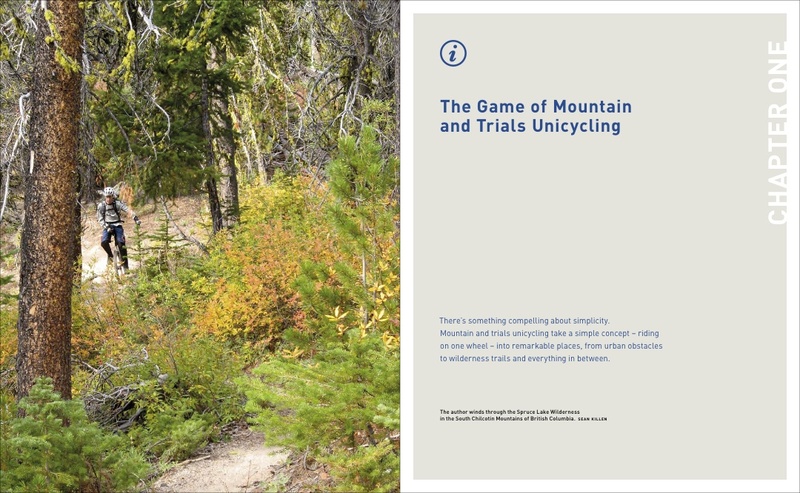 The 174 pages are filled with some of the best unicycle photography to date, complimenting the extensive knowledge of the sport found between the covers. Read it today! Supports Kindle, iBooks, Nook and most other devices. Includes full colour PDF for superior picture quality. Can I purchase the softcover book through Gradient Press? Only the eBook is available for purchase through GradientPress.com at this time. Please see the list of worldwide retailers to buy the paper edition of the book below. What will appear on my credit card billing statement? All eBook sales will appear on your statement as KHUNICYCLES. What eBook formats will I receive? You will receive download links for the following digital book formats: EPUB, Mobipocket (.mobi) & PDF. Please ensure your desired reading device supports one of these formats prior to purchasing. I'm having problems viewing the book on my Kindle device - any tips? Try reading it with the free e-book library management application Calibre. I lost my eBook files. Can I download it again? You may download the files by referring to the download links contained in your order e-mail which are valid for 3 downloads or 1 month maximum. My download link has expired. How can I download my eBook files? Please contact support@gradientpress.com with your original order details (e.g. order number or date). Can I share my copy of the eBook with others? This book was a ton of work and required major investment to make it possible. Please don't share or obtain pirated copies. Your support helps to show the legitimacy of this great sport, respects the work required to create this resource, and helps enable development of more resources in the future. How long will it take to get the eBook I ordered? Shortly after your eBook order is approved, you will receive an e-mail with a link to download your copy. Use your coupon code when checking out. eBooks are generally not returnable. Please contact us if you are not completely satisfied. Interested in selling the book? Contact Kris Holm. 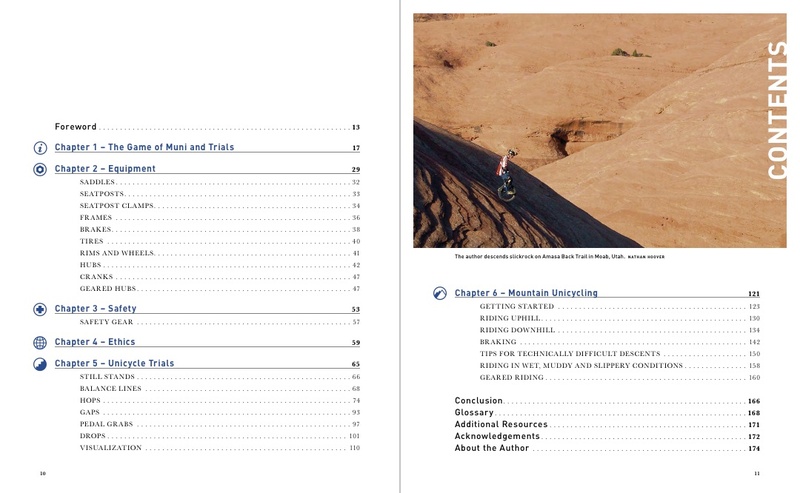 New Zealand Mountain Biker posted a highlight to The Essential Guide in their latest issue no. 51 and on the front page of their website. The European Outdoor Film Festival Tour invited Kris Holm to contribute a chapter to a book celebrating 10 years of outdoor film making. Find the book online (in German). The Ski Channel's 2012 documentary Winter explores the motivations driving a host of diverse adventure sport athletes, including Kris Holm. 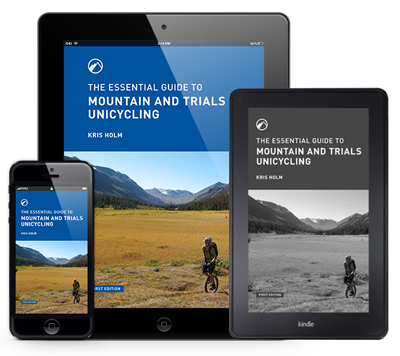 Recently they featured The Essential Guide to Mountain and Trials Unicycling on their website. The Georgia Straight reviews The Essential Guide to Mountain and Trials Unicycling in their Spring 2012 Adventure Issue. Read the article online. Mountain and trials unicycling are the remarkable sports of riding offroad on a single wheel. dwelling in obscurity through the 1980’s and 1990’s, thousands of unicyclists worldwide have now discovered that you can ride the same terrain as mountain bikers, from gravel paths and urban obstacles to challenging singletrack. 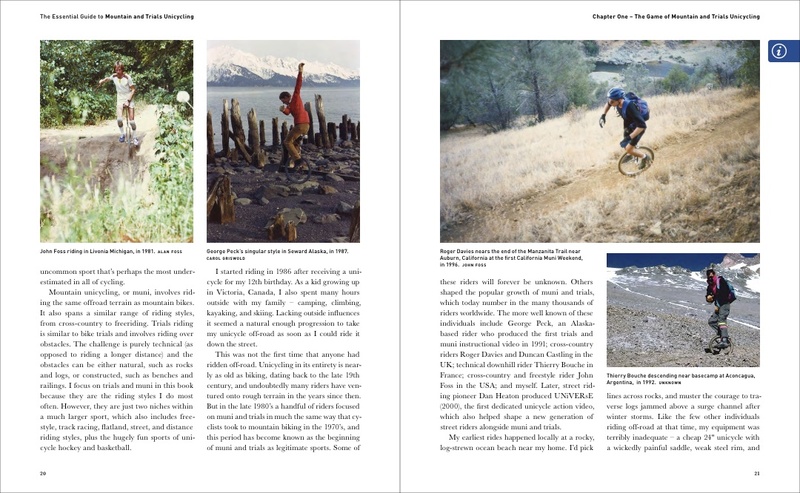 Explore Magazine’s Spring 2012 issue features Kris Holm discussing his upcoming book, The Essential Guide to Mountain and Trials Unicycling. Check it out at Canadian newsstands today! Explore also has a short post (with video) on their website featuring Kris Holm. 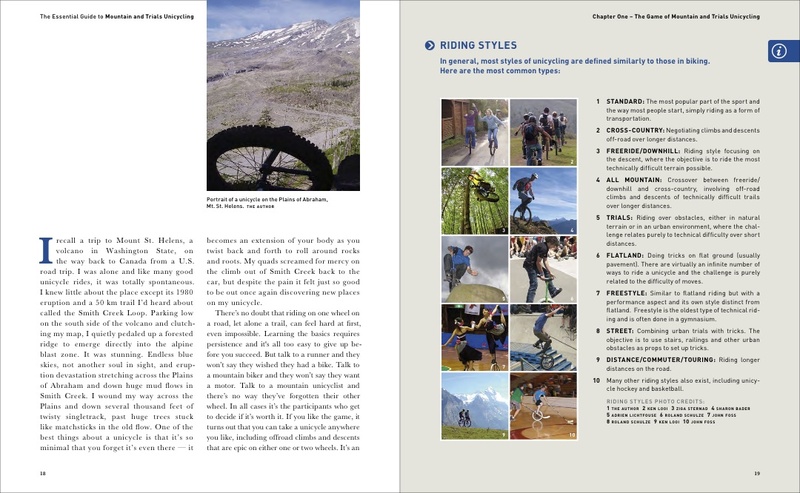 The Essential Guide to Mountain and Trails Unicycling, by Kris Holm, is featured in the Winter/Spring 2012 edition of Adventum Magazine. Browse the magazine online. Bootstrap by the fine folks at Twitter. CSS World Map by Winston Wolf (AKA Lukasz Popardowski). Zend Gdata interface for the Google API.